10210 - SS 1000 10' x 3/8" Mesh, Blue Mono - $111.39 The SS-1000 Super Spreader™ Series Cast Net is one of the fastest growing cast nets sold in America! A true pound of weight per radius foot, and a bullseye net design, help to propel this cast net during its throw and have it sink at a fast rate. 10230 - SS 1000 3' x 3/8" Mesh, Blue Mono - $44.05 The SS-1000 Super Spreader™ Series Cast Net is one of the fastest growing cast nets sold in America! A true pound of weight per radius foot, and a bullseye net design, help to propel this cast net during its throw and have it sink at a fast rate. 10235 - SS 1000 3.5' x 3/8" Mesh, Blue Mono - $46.27 The SS-1000 Super Spreader™ Series Cast Net is one of the fastest growing cast nets sold in America! A true pound of weight per radius foot, and a bullseye net design, help to propel this cast net during its throw and have it sink at a fast rate. 10240 - SS 1000 4' x 3/8" Mesh, Blue Mono - $50.81 The SS-1000 Super Spreader™ Series Cast Net is one of the fastest growing cast nets sold in America! A true pound of weight per radius foot, and a bullseye net design, help to propel this cast net during its throw and have it sink at a fast rate. 10245 - SS 1000 4.5' x 3/8" Mesh, Blue Mono - $55.03 The SS-1000 Super Spreader™ Series Cast Net is one of the fastest growing cast nets sold in America! A true pound of weight per radius foot, and a bullseye net design, help to propel this cast net during its throw and have it sink at a fast rate. 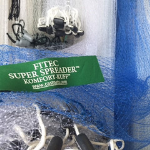 10250 - SS 1000 5' x 3/8" Mesh, Blue Mono - $59.08 The SS-1000 Super Spreader™ Series Cast Net is one of the fastest growing cast nets sold in America! A true pound of weight per radius foot, and a bullseye net design, help to propel this cast net during its throw and have it sink at a fast rate. 10260 - SS 1000 6' x 3/8" Mesh, Blue Mono - $67.27 The SS-1000 Super Spreader™ Series Cast Net is one of the fastest growing cast nets sold in America! A true pound of weight per radius foot, and a bullseye net design, help to propel this cast net during its throw and have it sink at a fast rate. 10280 - SS 1000 8' x 1/2" Mesh, Blue Mono - $90.94 The SS-1000 Super Spreader™ Series Cast Net is one of the fastest growing cast nets sold in America! A true pound of weight per radius foot, and a bullseye net design, help to propel this cast net during its throw and have it sink at a fast rate. 10440 - SS 1000 4' x 3/16" Mesh, Clear Mono - $114.52 The SS-1000 Super Spreader™ Series Cast Net is one of the fastest growing cast nets sold in America! A true pound of weight per radius foot, and a bullseye net design, help to propel this cast net during its throw and have it sink at a fast rate. 10450 - SS 1000 5' x 3/16" Mesh, Clear Mono - $145.66 The SS-1000 Super Spreader™ Series Cast Net is one of the fastest growing cast nets sold in America! A true pound of weight per radius foot, and a bullseye net design, help to propel this cast net during its throw and have it sink at a fast rate. 10460 - SS 1000 6' x 3/16" Mesh, Clear Mono - $182.49 The SS-1000 Super Spreader™ Series Cast Net is one of the fastest growing cast nets sold in America! A true pound of weight per radius foot, and a bullseye net design, help to propel this cast net during its throw and have it sink at a fast rate. 10470 - SS 1000 7' x 3/16" Mesh, Clear Mono - $232.88 The SS-1000 Super Spreader™ Series Cast Net is one of the fastest growing cast nets sold in America! A true pound of weight per radius foot, and a bullseye net design, help to propel this cast net during its throw and have it sink at a fast rate.